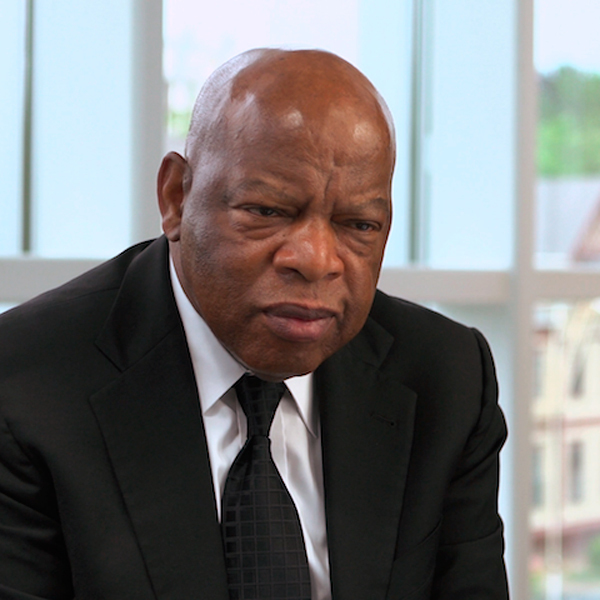 John Lewis is the U.S. Representative for Georgia’s Fifth Congressional District (D-GA). He has served in Congress since 1987, and was a leader in the civil rights movement. Lewis was born the son of sharecroppers on February 21, 1940. He attended segregated public schools in Pike County, Alabama. As a young boy, he was inspired by the activism surrounding the Montgomery Bus Boycott and the words of the Rev. Martin Luther King Jr.
As a student at Fisk University, Lewis organized sit-in demonstrations at segregated lunch counters in Nashville, Tennessee. In 1961, he volunteered to participate in the Freedom Rides. Lewis was beaten severely by angry mobs and arrested by police for challenging the injustice of Jim Crow segregation in the South. Despite more than 40 arrests, physical attacks and serious injuries, Lewis remained a devoted advocate of the philosophy of nonviolence. After leaving SNCC in 1966, he continued his commitment to the civil rights movement as Associate Director of the Field Foundation and his participation in the Southern Regional Council’s voter registration programs. Lewis went on to become the Director of the Voter Education Project (VEP). Under his leadership, the VEP transformed the nation’s political climate by adding nearly four million minorities to the voter rolls. Lewis holds a B.A. in Religion and Philosophy from Fisk University, and he is a graduate of the American Baptist Theological Seminary, both in Nashville, Tennessee. He is the author of Across That Bridge: Life Lessons and a Vision for Change (Hyperion, 2012), and his biography is entitled Walking With The Wind: A Memoir of the Movement (Simon & Schuster, 1998). What was it like to participate in the Freedom Rides? How and why did you first get involved in the civil rights movement? What was your life like as a young child? What did the civil rights movement accomplish? How did you decide to go into politics? What was the Mississippi Freedom Summer Project? Why did you criticize the proposed civil rights legislation at the March on Washington?